Using a spring and a ratchet to make human walking 7% more efficient, engineers have created unpowered exoskeleton ‘boots’ that could play a significant part in the future of rehabilitation after an injury. The boots copy the action of a walker’s calf muscle and Achilles tendon, which saves the body’s muscle energy and improves its already well-tuned stride. Although the energy saving seems small, a 7% reduction in energy is like taking off a 10-pound (4.5kg) backpack. Previous exoskeleton research had produced similar gains but only by using powered, pneumatic ‘muscles’. By harnessing the body’s own muscle power, the exoskeleton should be lightweight, and simpler and cheaper to mass produce to help injured people, which potentially makes it an affordable option for the limited NHS budget. 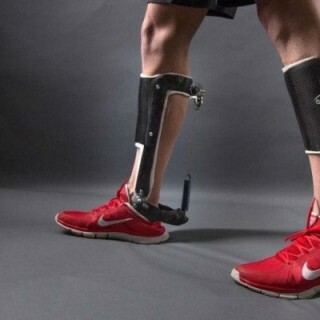 The new device was reported in Nature and the senior author of the study, Dr Gregory Sawicki – from the joint biomedical engineering department of the University of North Carolina and NC State University – said the exoskeleton boot acted ‘like a catapult’. The boots use a mechanical clutch that puts tension on the spring when the foot is placed on the ground but leaves it slack when the foot lifts forward to make a step. Within the clutch a ratchet engages with each footfall and takes up the slack on the spring. The ratchet locks while the foot is on the ground and releases again at the back of the stride. Dr Sawicki says: “The clutch is essential to engage the spring only while the foot is on the ground, allowing it to store and then release elastic energy. Co-author Dr Steven Collins, from Carnegie Mellon University, said that with some more development, the invention had the potential to help people who have difficulty walking. Can vacuum pressure limit brain damage after a traumatic brain injury?